I'm working through the bass guitar funk path and I reached the song 'Got To Be Enough' and I'm having problems understanding the tablature for it. I'm very familiar with standard notation (and I 'thought' tablature as well). The problem is that I don't understand where the measures start (i.e. beat 1) or if the notes are on the beat or off the beat or even when the notes are played. The different widths of the measures on the web page means I can't compare measures to work out the notes. The nearest I've got is to use a ruler to measure the width of the bar/measure from a print out and divide by 5 to get the 4 beats per measure. The instructors for the other songs I've worked through, until now, have all counted out the beats so that I knew what to play and when to play it. 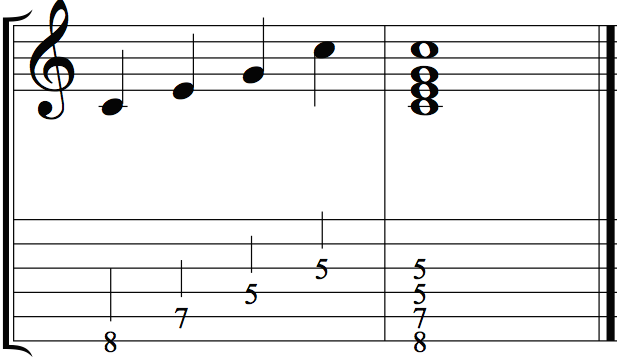 No idea if I'm correct or not, but most tabs I've seen seem to count on you knowing the rhythm before hand. They tell you what notes but not "when". The only advice I can give is to try to find the tabs along with standard notation. If that's not availible, just try to feel it out. Last edited by JBR97 on Sat Mar 02, 2019 9:22 pm, edited 1 time in total. OK. Thanks, I'll work on that. That is the problem with tab... there is little to no timing information provided beyond the tempo. If you're lucky, you get upstroke/downstroke, or reference to hammer-on/pull-off and slides. Tab was developed to provide people who can not read standard notation a way to learn to play songs that they are familiar with. It is a step beyond "playing by ear"
Tab alone, you'll never get it right if you've never heard the song before. If you can read standard notation, that's a better way to go. A good tab will also show the standard notation. So you can use the tab for shorthand to read the notes, and read the standard notation for the timing. It sounds like you were working from a tab which does not have both.